CLARKSDALE – Classic Southern soul masters starring multiple Grammy nominee Dorothy Moore of “Misty Blue” fame and Blues Music Award winner Johnny Rawls are cranking up the 24thedition of the Sunflower River Blues and Gospel Festival August 12 - 14, 2011 according to co-chairman Melville Tillis. Nominated for four Grammy Awards, Dorothy Moore, is making her debut appearance at the Sunflower and will close the main stage Saturday night. In addition to her four Grammy nominations and “Misty Blue” single that hit Number One on R&B charts and is included in the 2005 compilation album of “Classic Soul Ballads,” Moore is acclaimed for “Funny How Time Slips Away,” “With Pen in Hand,” and gospel recording propelling her into the Mississippi Music Hall of Fame, and the Governor’s Award for Excellence in the Arts. Tillis says Rawls was a favorite at the 2010 festival that drew a weekend crowd of 25,000 music fans packing downtown Clarksdale from France, Germany, the U.K. Portugal, Egypt, Scandinavia, and most sections of the U.S.
For the 24th consecutive year the Rising Star Fife and Drum Band founded by the late Othar Turner of Gravel Springs and continued by his granddaughter, Shardee Turner, will perform and march in procession. “We’re delighted over this booking; it maintains the Sunflower’s ranking by USA Weekend as one of America’s Top 10 places to hear authentic music,” said Tillis. “The Sunflower also is one of the few major festivals remaining free and open to all thanks to grants, contributions, and volunteers working all year to stage this celebration,” he continued. Being honored in a special memorial tribute on the main stage and also an educational forum are the Sunflower’s own family: musicians and key supporters who contributed to its success for the past two decades, explains Tillis. Included are musicians James Alford, Michael James, Wesley Jefferson, Big Jack Johnson, Foster, “Tater” Wiley, and Sarah Moore, owner of Sarah’s Kitchen, a classic blues club and restaurant featuring s soul food and a proving ground for fledgling and famous musicians. 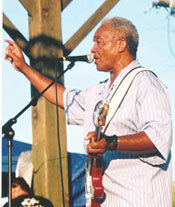 Blues Music Award winner Johnny Rawls returns to the Sunflower following his dynamite performance in 2010. The festival opens at 4:15 p.m. Friday afternoon with students from the Delta Blues Museum band performing on the main stage and closes with Nathaniel Kimble taking the stage at 10:00 p.m.
For the first time, Saturday morning’s acoustic stage will open at 9 a.m. on the main stage with Arthneice Jones, and breakfast being served beneath the VIP tent. The second acoustic stage kicks off on Sunflower Avenue at 1:00 p.m., and the main stage performances start with Neicy Kayinessa at 1:00 p.m. and continue through Dorothy Moore’s finale at 10:30 p.m. The Gospel Festival opens with Chris Coleman at 5:00 p.m. in the Civic Auditorium. VIP chairman John Sherman says the Sunflower’s super-size VIP tent next to the main stage has become so popular, its size is being expanded. The air-cooled tent is filled with chairs, linen-covered tables and unlimited beverages for VIP donors and their weekend guests. VIP donors also are treated to the festival’s Thursday night “Grits, Greens, and Barbecue” preview party in the historic district with cheese grits, barbecue, and turnip greens by soul food chef Louise Campbell. Initially organized to introduce Norwegians from the Sunflower’s sister festival in Notodden, Norway to Southern soul food, the menu has become a favorite with all, says Tillis. The complete lineup, updates, and donation levels of support for the tax-exempt non-profit Sunflower River Blues Association are available on the website www.sunflowerfest.org.